"Chambar: an unpretentious fling with fine dining"
...probably one of the more accurate statements a restaurant has used to describe itself. 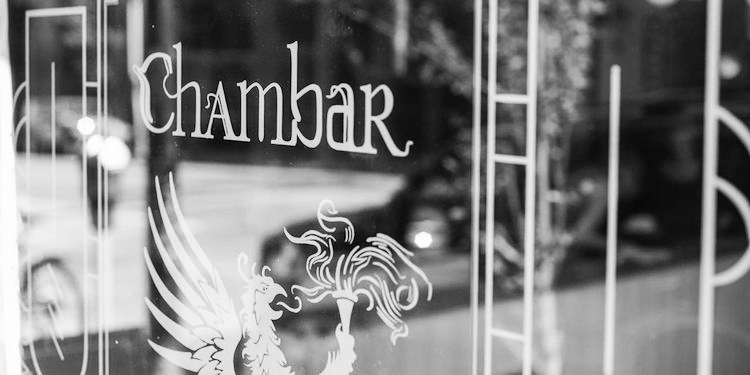 The Schuermans (owners of Chambar and Cafe Medina) have not disappointed with the new and improved Chambar on Beatty Street. The variety of food has expanded and the dining space is nothing short of modern elegance. My review today is based off my most recent two visits. 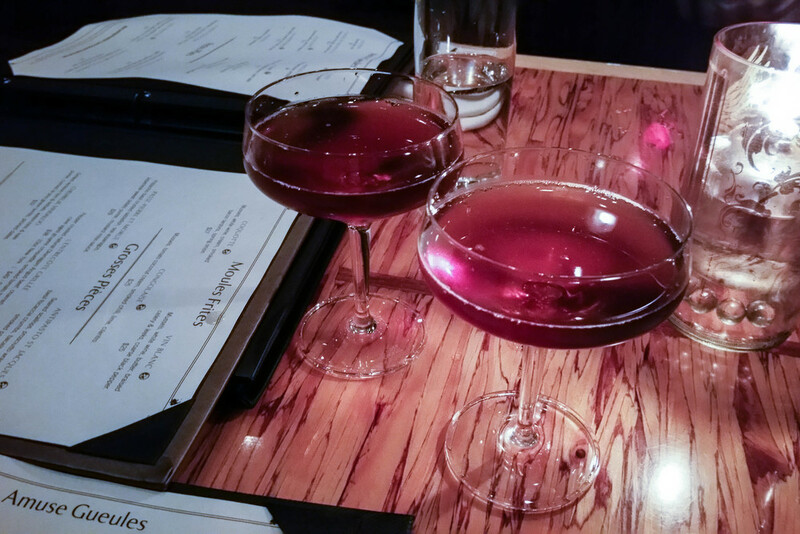 5/5 - You really can't have a complete meal at Chambar without ordering at least one drink from their extensive menu. This cocktail is my go-to every time I visit and there's really no reason to doubt why. Mix Japanese plum wine, delicately smoky alcohols, a good smoking and you get a drink that is elegant and a treat for not only your tastebuds but your nose as well. Along with the aroma, I love the smokiness in this drink as it complements the sweeter components of the drink. Another bonus is the actual smoke show you get at your table when the hostess opens the smoke filled shaker. 4.5/5 - Definitely an interesting dish. Frog legs aren't exactly what I eat everyday and I admit that the texture of these is pretty foreign but the taste definitely grows on you. I'd like to add that the legs are quite hot and the spiciness caught me by surprise. 4/5 - Harissa prawns are such a delicacy and the ones here are surprisingly fresh, large, and juicy. Seafood like this always tastes good with herbs and lemons so you really can't go wrong with these. I admit that this is a pricey dish however, you're paying close to $3.25 per prawn that take half a bite to devour. 4/5 - This is one of the more filling appetizers on the menu as you get not only seafood, but generous portions of meat in each as well. 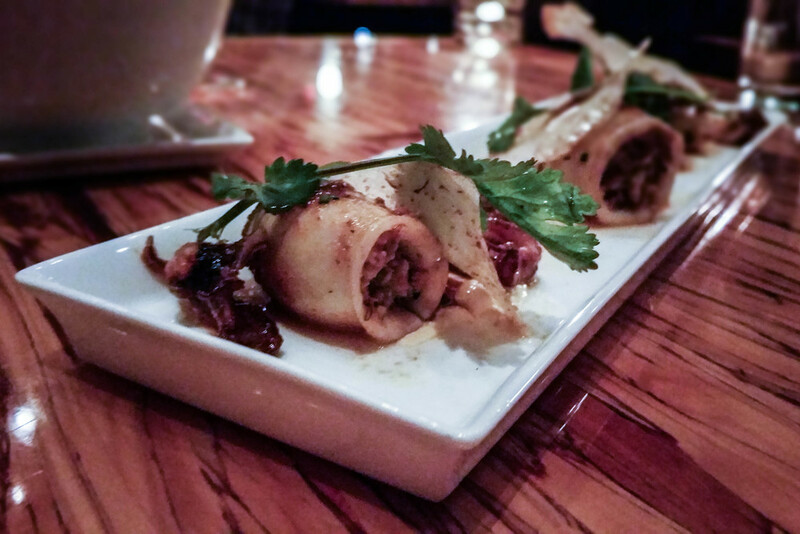 Heavily spiced and stuffed full, these calamari "wraps" are well accompanied by a blander taro crisp and mild aioli. If you're only thinking of order one appetizer, this is probably suitable. 5/5 - There is probably nothing that Chambar does better than these giant pots of steamed beauties. 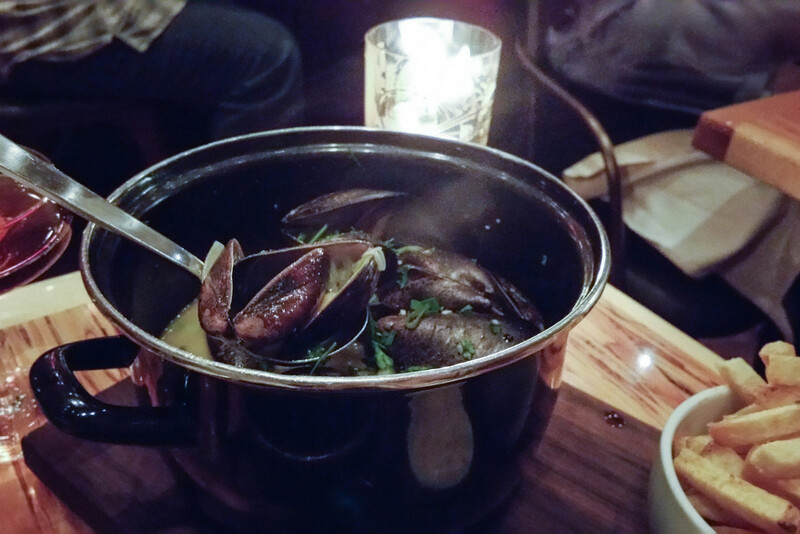 Mussels are Chambar's forte and you'd be missing out if you didn't order at least one pot of them. Each moules frites come with a massive pot of mussels which is cooked in a broth of your choice and a side of fries and sauce (which I can't remember if it's tartar or mayo but either way it's pretty bomb). 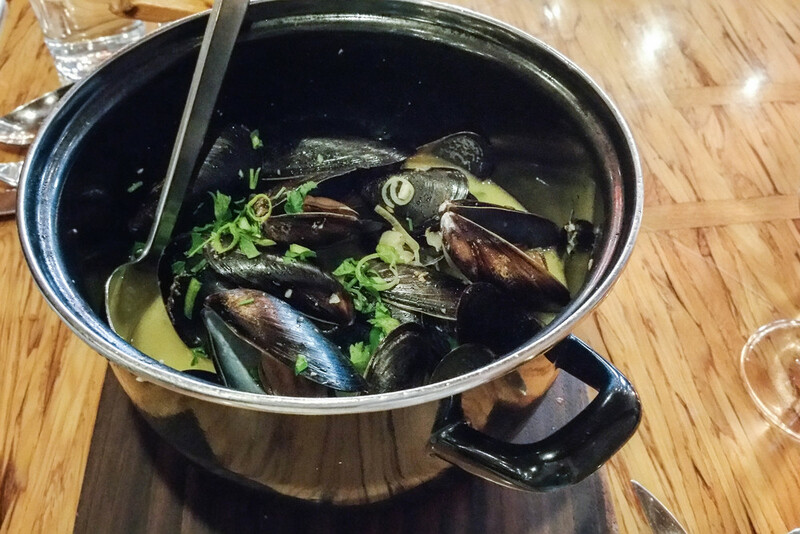 The mussels are plentiful and very juicy - I rarely find a small piece of meat. It's worth mentioning that the fries here are unexpectedly good. As a person who is "meh" about fries, I always find myself pigging out with the whole bowl to myself. 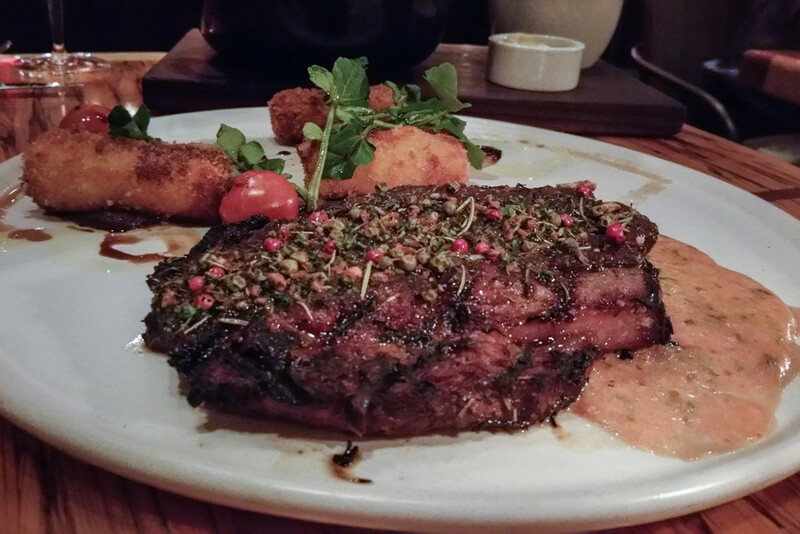 4/5 - Honestly, I'm not much of a "large piece of meat" girl but I will say that this massive piece of ribeye was cooked quite well. I didn't really have any complaints during the first few bites but I found the meat to be a bit too dry for my liking. J however, really liked it. The "medium rare" could've been more rare. 5/5 - This dish really caught me by surprise - the presentation is very elegant and the flavours are very well complemented. The duck wasn't overcooked, very juicy, and easy to eat. The pairing of Japanese inspired pickled vegetables and sliced pear adds a very refreshing note to the dish as well. I'd like to point out that this Asian influenced dish really sets itself apart from other "Asianized" dishes in other Western restaurants. From my experiences at many Western restaurants in the city, Asian inspired dishes just don't taste right; may it be the wrong mixture of flavours and textures or poorly cooked carbs (rice in particular). This duck dish understands the delicate ingredients and makes them work well (the rice finally tastes like good rice). 4/5 - As someone who doesn't usually use tagines, having a dish served in one is pretty cool. I believe the lamb is actually cooked in the same tagine which is why there is such a strong aroma when the lid is opened. The dish is almost like a heavy lamb stew with veggies and carbs - a very complete meal in itself. The lamb is very tender, almost velvety but J found that the meat tasted dry after a while. 3.75/5 - Most creme brulees are served in ramekins but this one is served in a large bowl with various toppings. Personally I don't think it looks all that great presented this way but I guess it's something different from the normal. Although I liked the honey flavour, I found that the top sugar layer was too thick and took almost too much effort to break apart. As I prefer a more simple creme brulee, I wasn't a big fan of the pastry, granita, and nuts on the top. I think they tasted well separately but not necessarily with the overall dessert. 5/5 - I say if you like chocolate, look no further because your dessert is right here. This picture doesn't do this dessert any justice (I blame terrible lighting) as the plate is actually gorgeous when presented in person. The mix of crisp, crumble, smoothness, sweetness, and tarteness is really what makes this dessert so superior. I loved the creaminess of the mousse paired with the chocolate crumble and thin crisp of caramel. Finsh off each bite of chocolate with a spoonful of the raspberry sorbet and I can assure you that your stomach with be preparing for a second order. 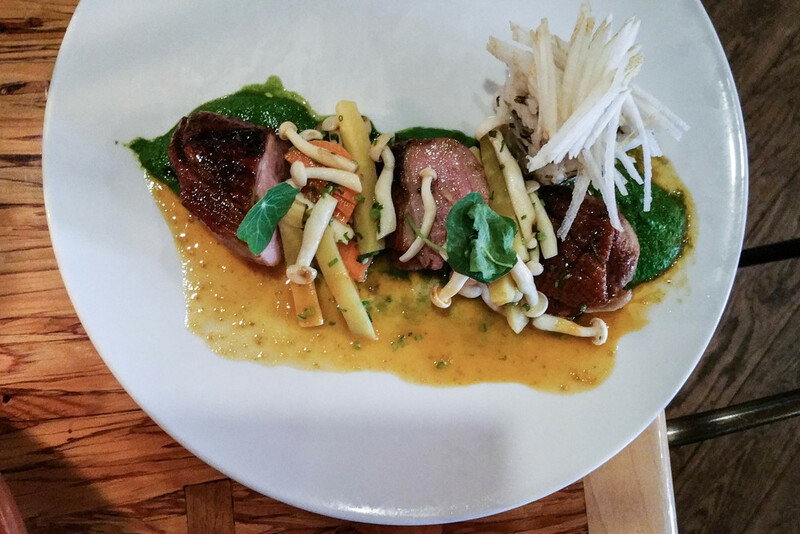 Dining at Chambar is definitely a treat due to its high prices but it is arguably a wonderful experience whether it be for a special occasion or for just a casual meal. The quality of food, drinks, service, and decor make Chambar a modern yet classy spot for everyone to enjoy. For myself in particular, Chambar finds itself as one of my top picks for a nice European inspired meal. Although I haven't gone myself, I hear that the brunch here is just as amazing as the dinner experience - something worth keeping in mind. If you haven't had the chance to visit their new location, you really ought to.